The light bulb has finally cut on which is why I am able to write this blog. The things I understand and have been delivered from are what I can teach about to help others understand. This blog is about being thankful. Giving thanks to God is a preventive measures to keep the enemy from stealing your faith. It kills doubt and unbelief because your heart changes as the praise flows out of your mouth. For example, a person may be fed up with their car. The car could be a decent car but the paint is chipping and it has a lot of miles on it. The person is constantly complaining and ungrateful about the car. They are always talking about how they want a new car but can not afford one and then they start wishing they had a better job because of all the bills that have to paid. The worry get worse so much that this person starts to get depressed and wishing they had a completely different life all together. Then they start making decisions about how they feel and not by what God said. Their focus is not on God but on their situation. What if the person just continuously praised God for that car? The person was so thankful and so appreciative that the car never got a spot, bird poop or dead bug. They new God blessed them with that car and their situation could be a lot worse. They also know that if God blessed them with this car He can bless them with another one. Since this person is not depressed or ashamed about his car he let his boss ride with him to lunch one day to a company event. The boss complimented the person for the up keep of the car for the type of car it is. The boss told the person about a position opening up to where he would receive a new car that the company would pay half the car note on. The person applied and got the position. Now the thankful person got a promotion and is paying for a new car at half the price. Wow! When we show God we are grateful the doors of heaven open up. Giving thanks is not just about singing to a praise song and that is it. It is a lifestyle! A good example is giving your best friend a pair of earrings and she is all excited. Now this is your best friend so you two hang out at least once a week. A month goes by and she has not worn them so you ask her about them. She says one broke because she took them off and laid them on the couch where someone sat on them. On the couch? Your heart is broken because those earrings were expensive. You say O.K. but in the back of your mind you are thinking I forgive you but I will never buy you expensive earrings again. Why? because the person did not show you she valued and appreciated them. If the friend had worn the earrings and taken good care of them then the other friend would have blessed her with some more. Wow! 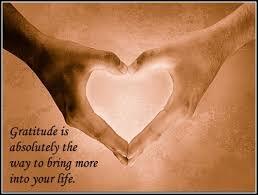 In conclusion, being grateful in everything leads to excellence and prosperity in every area. Ungratefulness leads to misery, worry, confusion and depression. Being grateful leads you to the promised land flowing with milk and honey. Ungratefulness leaves you doing circles in the wilderness for 40 years. Brilliant web site, I had not noticed healthylifestylesforwomen.blogspot.com previously during my searches! I would appreciate if a staff member here at healthylifestylesforwomen.blogspot.com could post it. What link are you having trouble with? Please let us know so we can help. I have a question for the webmaster/admin here at healthylifestylesforwomen.blogspot.com. May I use some of the information from this blog post above if I provide a backlink back to your site? Thank you for reading my blog. What is the name of the website so I can take a look? Thanks for sharing this link - but unfortunately it seems to be not working? Does anybody here at healthylifestylesforwomen.blogspot.com have a mirror or another source? Can I use part of the information from your post right above if I provide a link back to your site?